Georges Masraff, a Michelin-star awarded chef who also holds a degree in medicine and has worked for the humanitarian organization “Doctors Without Borders,” has been named executive chef at Lenox Hill Hospital. Chef Masraff will be responsible for hospital-wide oversight of food quality, culinary training, as well as menu and recipe development. This strategic hiring decision at its flagship Manhattan hospital is in line with Northwell Health’s recent initiative to transform traditional hospital food into wholesome restaurant-quality fare. Chef Masraff comes to Lenox Hill after nearly half a century in the culinary world. Upon completion of Paris-Sud University School of Medicine in Paris, France in 1970, Chef Masraff worked for “Doctors Without Borders,” an international humanitarian organization that provides medical aid to populations in need. After a couple of years as a doctor, he decided to pursue his true passion – cooking. He owned and operated two Michelin starred restaurants in France before moving to New York in 1985 to take on the role of executive chef at Central Park’s iconic establishment “Tavern on the Green” supervising a staff of 220 cooks and accommodating more than 3,500 guests daily. For the next three decades, he served as executive chef, corporate chef and culinary consultant at various NYC restaurants, a private club and a specialty food market. 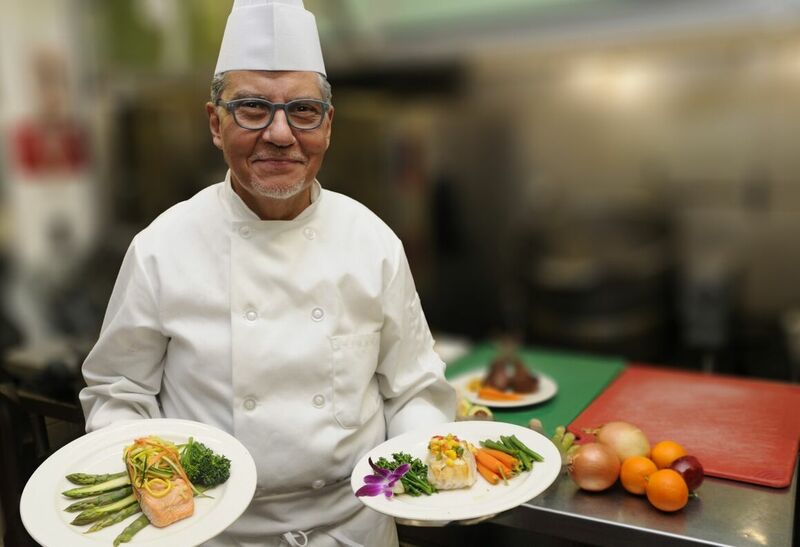 Northwell’s food and nutrition wellness transformation began a little over a year ago with the recruitment of Chef Tison, who spent 14 years as executive chef of NYC’s Plaza Hotel and has received the prestigious James Beard Award, known as the Oscar of the culinary world. The health system’s goal is to enhance the hospital culinary experience by crafting meals that support healing and well-being by using fresh local ingredients, utilizing less salt and sugar, avoiding saturated fats, minimizing frozen, canned and processed ingredients, and opting to bake foods instead of frying them.